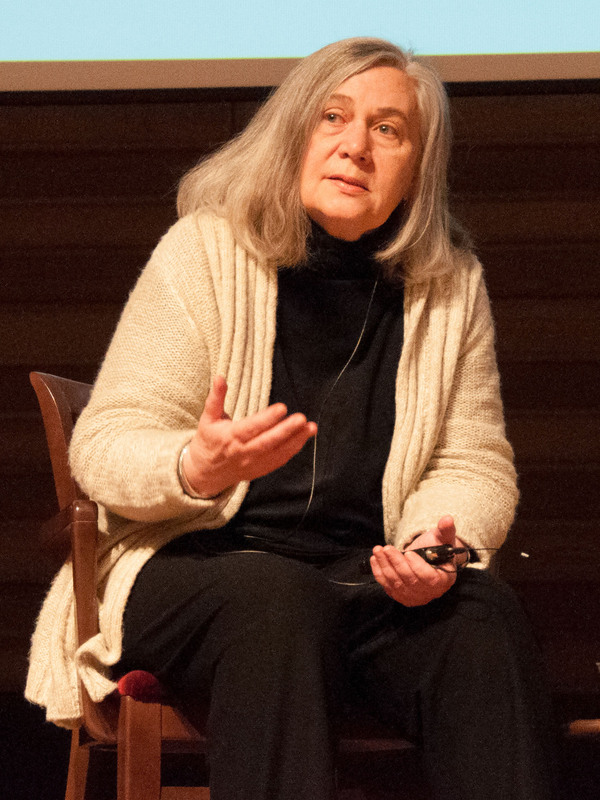 Marilynne Robinson speaking at the 2012 Festival of Faith and Writing at Calvin College.”Marilynne Robinson” by Christian Scott Heinen Bell – Own work. Licensed under CC0 via Wikimedia Commons. I read Gilead and Home several years ago and have Lila on my “want to read” list. So when I heard that Marilynne Robinson was speaking at Northwestern University while I was at a work conference near O’Hare Airport, I jumped on the opportunity to go hear her. She was speaking on “Our Elegant Universe: Is Beauty an Accident?” as part of a program called The Veritas Forum. She gave a prepared talk on the theme and then participated in a question and answer period with an audience of at least 500. I scribbled some notes from the talk and Q and A time. This is not a verbatim rendering, but rather a summary that I hope is faithful to her words and thought. I thought others who love Robinson’s work might enjoy this, and those who have not discovered it might try one of her novels. In her presentation, she argued that the beauty of the world, the elegance of the universe (of which she sees us a part) is no accident. She thinks that science and theology ought not be at war over these things when in fact both perceive the grandeur of the creation. She contended for a “divine freedom that precedes reality” and that materialist explanations don’t allow for that which is beyond our own experience. She sees in the sheer variety of beauty,rather than being one thing, the grace of God. What is a day like in the life of Marilynne Robinson? Has that changed since Gilead? Not really. I am a solitary creature surrounded by many, many books. My sister visits me a couple hours a week to connect me to the outer world. Otherwise I stay in my house except for walks which I’m told are good for my circulation. Otherwise, I stay in my house. I like my life but many would not find it enviable. I’m a monk, basically. Was there a “conversion moment” in your life. I can’t remember any “dawning”. I never thought of myself as other than Christian. I almost went to divinity school except that there weren’t many opportunities for women. I went to graduate school instead. I was always good at writing. My brother encouraged me and Housekeeping was kind of a family artifact. But as for my Christian experience, I would describe it as uniformity with enriching. Have you ever thought that the Christian subject matter of your novels would limit your audience? I never considered it. I was never a careerist. I wrote about what interested me. I was surprised by the reception of Gilead. I don’t think about my readership. I’m just glad they are there. Writers should trust their own insights and trust the interests of the public. When you look at the world, do you ever think evil overcomes beauty? Does this argue against God? Most people throughout history have lived with great afflictions and yet many have produced works of incredible beauty in the belief that there is something beyond evil and suffering. Beauty is a signature of the divine. But nothing is identical with God — that would be blasphemy. What challenge would you leave with students? 1. Remember who you are, the flower of the universe. You can do all kinds of things and you won’t know until you try! 2. Read the primary sources! This is a much-edited version of 90 minutes of presentation and dialogue. Besides the fact that she lives surrounded by many books (! ), it was a delight to spend an evening considering the beautiful aspect of our pursuit of the good, the true, and the beautiful. Others may see beauty in a world without God but what struck me was the seamless arc between her perception of the beauty that finds its source in God and the beauty manifest in her writing. I for one am glad she simply writes what interests her. I’m thankful that she has given expression to this and trusted to the interests of her audience for in so doing she has given us great works of beauty.